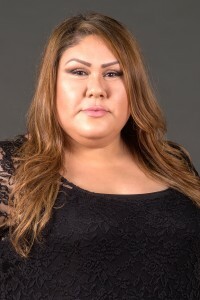 Ramona has been licensed for 15 yrs but has been in the industry for 30 yrs first as a salon sales consultant educated by industry manufactures such as Sebastian hair care, Nioxin for thinning hair, Wella and Framesi hair color just to name a few. 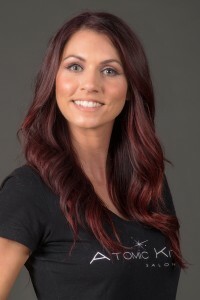 She is a certified Great Lengths hair extension technician and platinum member. Ramona is also certified in the tape in method of hair replacement. Hair extensions are her passion because they give her the tools to change people lives by transforming their hair. She uses primarily Wella color and Enzyme developers to create beautiful hair color. She loves to challenge color correction and blonding is her forte. Ombre hair is the newest trend she has mastered. Long layered styles are her specialty haircuts. 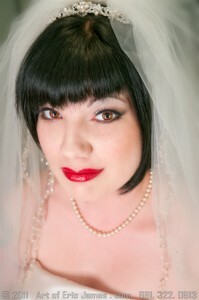 Ramona loves make up and does all genres of looks including special Fx and makeup for photo sessions and special events. She does airbrush foundation for its flawless look and long lasting results. Ramona is available for day and evening appointments. Cameron was the owner of the very successful Rage and Outrage salons for 23 years and Licensed for 35 years. 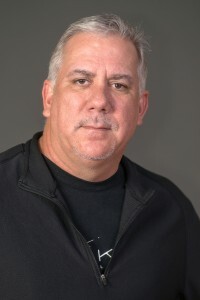 He is Agency represented by The Wall group as an editorial and advertising stylist for TV and Movie sets. Cameron has advanced education from many industry greats Trevor Sorbie, Robert DeLanza, Vidal Sassoon, and Toni &Guy. He also worked for Nexus hair care as Part of they’re design team under Patrick Daniel the director of education. 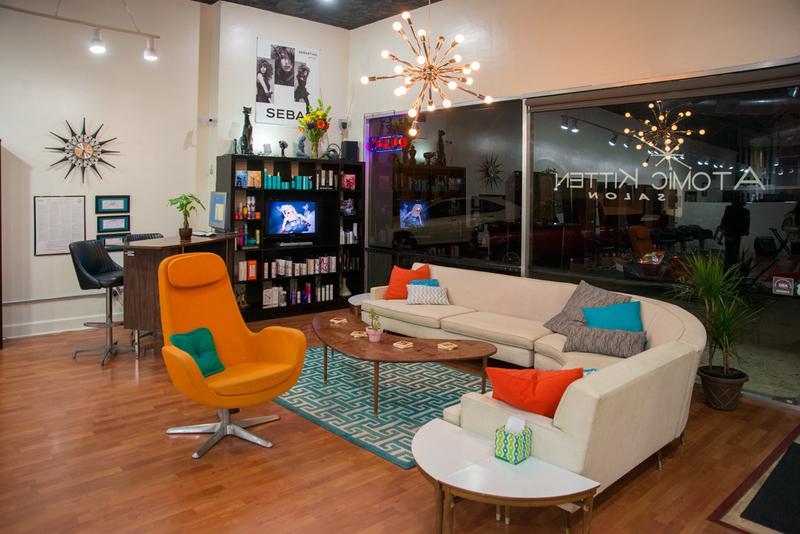 His area’s of expertise are Men’s hair design, keratin smoothing, perms, color and evaluating what styles work best with you face shape and lifestyle. If you are a professional or have a busy lifestyle and time is of the essence Cameron would be a good fit as he prides himself in fast, efficient and precise work. Maria has been licensed for 9 years and was one of our original stylists when we first opened She specializes in vintage and pin up hairstyles but can do any style for weddings, proms, and photo sessions. 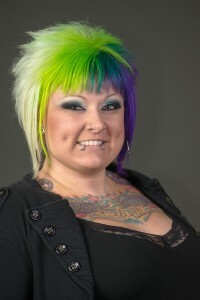 She uses Wella color and specializes in bright fashion colors. Maria did amazing extreme hairstyles at our Battle of the salons competion. Big hair is her forte but she can do hair extensions, hair color, and is excellent at short fun haircuts. If you are ready for some fun hairstyles and color Maria is a very passionate hairdresser and can create any hairstyle you can dream up. 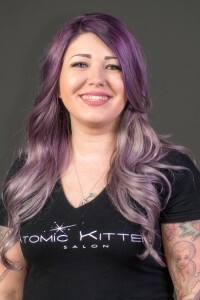 Cass has 5 yrs experience doing hair at Atomic kitten salon. She received her training at the Paul Mitchell Academy in Santa Barbara Ca. where she participated in the North American Hairstyling awards and editorial photo sessions. She uses Wella color and participated in Wella Trend Vision Young Talent National color competion. 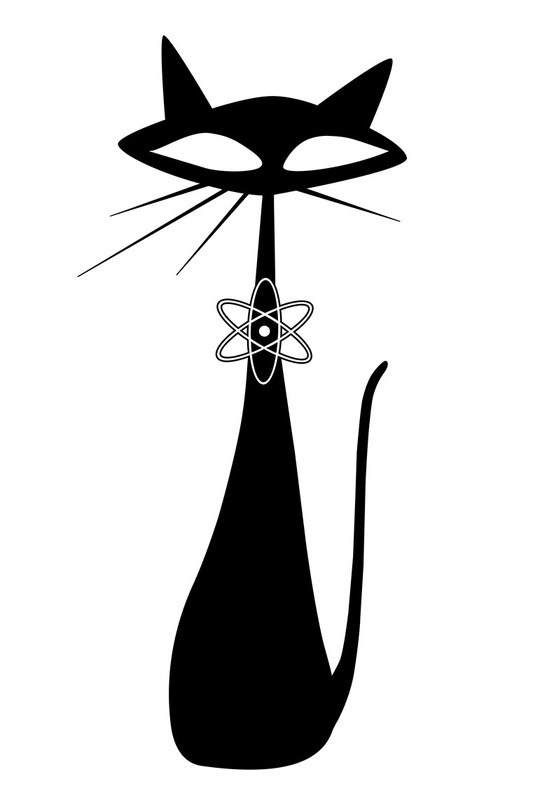 She was also part of our atomic team that won Battle of the salons. Cass keeps herself educated on the newest color and cutting trends with expertise in Balayage ombre technique and babylights.You can see her amazing hair transformations on her instagram page. She is one of our busiest stylists. Advanced education is very important to her. She stays up on the latest trends and products. Stephany primarily uses Wella color and was a national trend vision participant. She did amazing avante garde stylings at our Battle of the salon competition. Stephany uses Olaplex to insure the integrity of your hair is not compromised in achieving beautiful hair color results. She will consult with you on the best options available for your hair condition, skin tone and face shape. 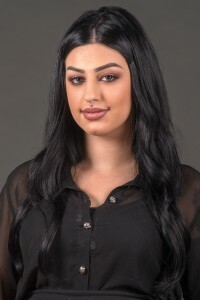 Stephany takes her time and is a perfectionist whether it is an intricate weave, seamless balayage ombre, or color correction you will have the best hair possible. You can see her works of art at instagram. Prepare to be amazed. Cheryl has been licensed for 13yrs as a barber / cosmetologist. This makes her a versatile stylist for both men and women’s hair. For men she excels at clipper cuts fades and all phases of men styles including facial hair grooming. For women she is a precision hair cutter and foil weave artist but keeps educated on new techniques and does beautiful balayage ombre color. 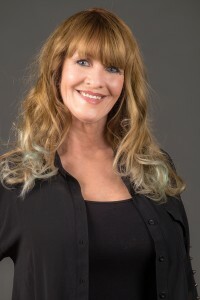 She is certified in the original Brazilian blowout hair smoothing treatment.Cheryl is also a hair extension technician who does the tape-in method of extensions. As a special occasion stylist she does up do hair styles and makeup for weddings, proms, formals and photo sessions. Cheryl is also available to travel to your location. Adriana Chavez ~ Master Stylist-10 yrs. If you can imagine it she can achieve it from seamless balayage ombres, hot reds to beautiful blondes and brunettes. 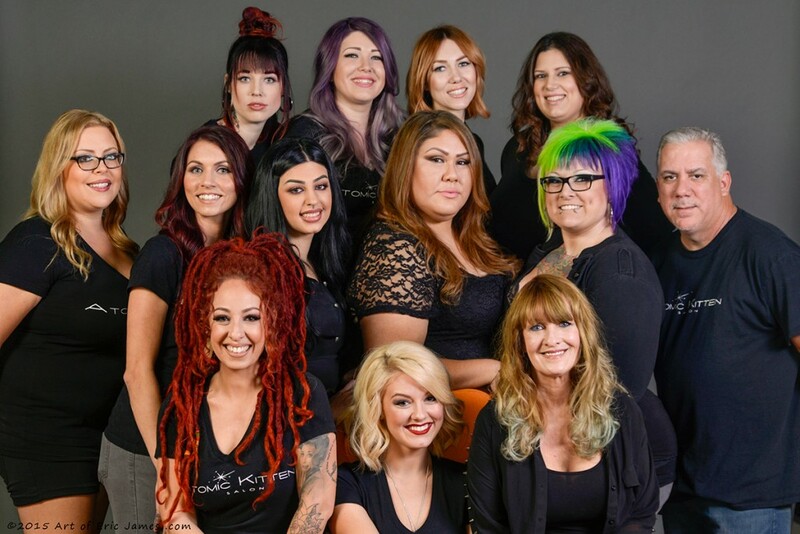 Her skills and knowledge make her a great choice for the most challenging hair types such as highlights on super long thick hair or color corrections. She is certified in the keratin smoothing system to straighten curly or unruly hair. As a special occasion artist she can create amazing looks in make up and styling for all ages. She also has mad skills as an avante garde stylist as she showed at the battle of the salons competition. She is our fearless one. Brittany Holland ~ licensed for 4 years. She is our Artist. Your hair is a blank canvas to which she creates a masterpiece. You know the amazing color melts of pink purple and lavender that looks like a sunrise at dawn this is the kind of hair artistry Brittany is famous for. She is a formally trained fine artist in oil paint so its no wonder she has that creative vision for haircolor. 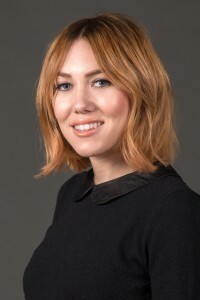 She is Redken educated so she can also create art for beautiful blondes, reds and brunette color. You can be assured your hair stays in optimum condition throughout the color process as she uses Olaplex treatment to reconstruct your hair as she colors. You can view some of her works of hair art at her Instagram page Cozmic color. She is also featured on the scissor salute show for color creations.